Fete de la Musique in Berlin! The festival for live music, all around town! today summer officially started, the weather is nice and it is weekend! A lot of cool events are awaiting you this summer. One of the nicest music festivals that takes place every year on the longest day of the year is the Fete de la Musique! What is so special about this festival is, it´s totally for free and really all around the city! It is an open air festival and luckily today the weather is perfect for that! Apart from the bands playing at stages across the city, during the festival street musicians are allowed to spontaneously play their acoustic songs on any street corner. So go out on the street tonight, bring a couple of beers and a couple of friends and let yourself be entertained by musicians from all kinds of different music genres. 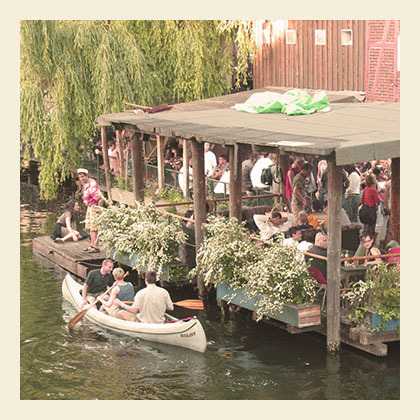 Close to the EastSeven Hostel you will find the Fete de la Musique at the Mauerpark, at Bassy Cowboy club and at the Kulturbrauerei (FranzzClub). Have a closer look at the programm and see who is playing where and when, at the hand out at the reception, or at the Fete de la Musique homepage. For more information on what to see and do in Berlin please read the hostel blog or ask our local staff at the reception! Hope to welcome you soon at the EastSeven Berlin Hostel!